Tasty Salad Recipes, Easy To Make, Full of Nutrients. Good for any season, these Salad recipes will make a convenient source of healthy, easy, diet or comfort food. A whole bowl full of vibrant colors and nutritious ingredients, ready to eat in minutes. Just Toss and turn in some good dressing and Voila......Really! what more can one ask for?? I personally use a lot of vegetables, fruits, nuts and sometimes meat.The good thing is that there are no fixed ingredients. Use whatever you have available. Raid your refrigerator for any leftovers that you can use,along with some fresh veggies and fruits. Even if you use an entirely different set of ingredients to make your own version it is still going to turn out fabulous. Check out summer salads, cold pasta salad and vegetable salads. There are a lot of dressings available in the market these days,that are very handy. But if you prefer home preparations then scroll down to check out a few that I have included here. One of my favorites is the healthy mayonnaise with minimal oil and No Egg . Be it a party, picnic, pot luck or a family dinner....You will definitely find a appropriate salad recipe here that suits your need. Even fussy eaters, don't mind a bite of soft steamed veggies and crispy greens, along with some nutty crunch mixed in a delicious dressing. Green Salad Recipes - Salad recipes include, mixed green salad recipe, cucumber and avocado salad, spinach and strawberry salad, watercress and rocket salad and salad dressings. Reasons to eat a Salad - Why are salads healthy? Whatever be the origin of salads, the fact remains that eating them is a healthy option. If we look at any culture of the world, we will find that raw fruits and vegetables were always consumed in abundance, in their history. Salads can be as humble or low calorie, or as extravagant (topped with cream and mayonnaise) as you want. By incorporating salads in your diet you can ensure many health benefits for a healthy you. * Salad recipes are very easy to make and fun to eat. * Colorful concoction - You can use vegetables and fruits of different colors to make the salad look vibrant and appealing to the eye. * Eating Salads gives you the benefits of the vegetables and fruits. Most salads are high in fiber, which is required by your body for digestion. * Dieting? The best and healthy way to diet is have a low calorie salad with lots of greens and other vegetables and fruits. * Salad makes you feel full, while it is light on your belly. * Do you find it hard to follow the food pyramid? Well eating a salad a day, will ensure your 4-5 portions of vegetables is taken care of. 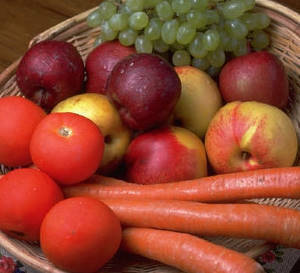 * Antioxidants - Most green and vegetable salads are good to provide the body with antioxidants. They help to fight the free radicals and protect the body and organs from unwanted complications. Not to mention, they help in building the body's resistance. * Using olive oil and nuts in the salads ensures a good supply of healthy fat for you. Eating good fat is very essential, to fight against the heart problems and many other ailments.